I am finally home, back at my own computer (being back on my computer is just as good as being back in my own bed! ), and ready to share all of my adventures in California for the World Premiere of Brave as well as the opening of Cars Land. While I was in North Carolina this weekend, I was able to chat with a few of my friends about seeing Brave and thought I’d answer some of their questions about the movie. I can answer that question with a resounding YES. So did my 15 year old daughter (so far, she’s my only child to have seen it yet). I loved the movie and was very moved by many things about it. What ages should see Brave? This question has come up again and again, and I don’t have a clear-cut answer for age-appropriate viewing. While some 5 year olds would cower at the rather intense bear scenes, I know that most of my kids would have been fine seeing it at 3 or 4. If your child gets scared by loud animals noises or chased-by-animal scenes, regardless of age, then this movie is probably not for them. However, in terms of language, gorey/graphic scenes, and subject matter, then I would give Brave high marks. Since my kids don’t get scared easily, I am much more concerned with appropriate and positive content. I think that only parents can know how their child will react. Personally, I thought the bear was much less scary than a creepy, evil character like the evil queen in Snow White (just as an example). Will adults enjoy Brave, or is it a purely “kid-geared” movie? One of the things I adore about Pixar movies is that they are equally entertaining for kids and adults. While the film is appropriate for kids, the story line is solid enough to keep parents entertained as well. I love that. What was your favorite thing about Brave? 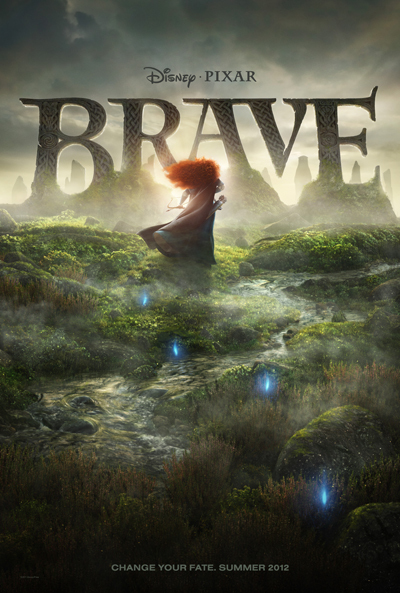 Honestly, the setting and the music were my favorite things about Brave, and those are the aspects that have stayed in my mind since seeing the movie last week. I also loved the focus on family and the fact that Merida has a mother and father who are married and 3 siblings (yay for the big family!). What about the focus on rebellion? As a mother to two teens myself (and remembering my own teenage years) I thought Merida’s complaining and rebellious spirit was pretty mild. But instead of Merida’s rebellion, I focused on and really appreciated the process that she went through, as she realized that she had been wrong about her mother and as she worked to make things right. I thought that the message of being truly sorry and righting her own wrongs was a strong and important message. There are some life lessons that are not learned without mistakes. What did you think about the male role models in Brave? Honestly, until people started asking me about the male characters in brave, I didn’t give them much of a second thought. They are entertaining, and I see movies primarily to be entertained. Did I learn anything from them? No. Were they characters I would want my kids to emulate? Not really. The male characters really played a supporting role for comic relief. It didn’t bother me. Is Merida a good role model for girls? Yes, I would feel comfortable with my own girls looking to Merida as a role model. Sure, she was not perfect. She fought against the control of her parents. But unlike many kids (in and out of the movies), Merida was strong enough to realize she’d done something wrong and eventually own up to her mistake and try to repair the damage. Merida was a princess but not the typical girly-girl princess. She had a mind of her own. And while she wore her pretty princess dresses and learned the typical princess obligations, but she also explored her adventurous side. I thought she was more human and relatable than many of the typical princesses that I see in other movies. In the end, Brave is a movie I will wholeheartedly recommend to my friends. Disclosure: I saw Brave in Los Angeles as part of an expense-paid press trip for the movie. All thoughts on the movie are purely my own. As you could tell from my FB, my nearly 3 year old daughter and I loved it! She definitely curled up to Daddy during a scary scene, but overall just loved the whole thing (and went back for a second viewing tonight!)! I liked that she was an independent princess that wasn’t chasing a prince– happy to have my little one absorb some girl power and a great family dynamic (The brothers hold a place in my heart because they’re the only thing that’s helping warm her up to a baby brother… She was sobbing when we told her it was a boy bc she wanted a sister… So I’m thankful for the little brothers in the movie)! SO jealous that you got to go to the premiere– looked like a blast!! P.s. Saw Candyman and crew on Saturday, but didn’t really get a chance to chat! Hope to see you all soon!